recurrent processes of the transformation and migration of matter in nature having a more or less pronounced cyclical character. These processes have a definite forward motion because the cycles in the cyclical trans-formations in nature do not repeat themselves completely and there are alway some quantitative and qualitative changes in the substances formed. The concept of cycle of matter has often been interpreted metaphysically as movement in a closed circle. This is radically wrong. About 5 billion years ago matter on earth became differentiated, dividing into a number of concentric shells or geospheres —such as atmosphere, hydrosphere, earth’s crust, granitic shell, and basaltic shell—differing from each other in characteristic chemical composition and physical and thermodynamic properties. In later geological time these shells evolved in the direction of a more stable state. The exchange of matter continued between all the geospheres and within each individual geosphere. In the beginning, the removal of matter from the earth’s interior to the surface as a result of the fusion of easily fusible matter and degasification played the most important role in these processes. Insofar as one can judge from the surviving geological evidence, this stage of exchange was still very extensive in the Archean era. At the same time there were intensive oscillatory movements in the earth’s crust and broad mountain-forming processes that created folds everywhere, as well as energetic volcanic activity resulting in the formation of thick layers of basalt. Intrusions and granitization were widely developed. All these processes took place on a more vast scale than in later geological periods. Substances were carried to the earth’s surface in the Archean in much larger quantities and possibly from deeper regions of the planet. The exchange of matter between the deep regions and the earth’s surface subsequently decreased. Quieter regions of the earth’s crust—platforms and regions of intense tectonic and magmatic activity, geosynclines—became differentiated at the end of the Precambrian. The platforms grew with time, while the geosynclinal regions narrowed. In the Recent period, the exchange of matter between the geospheres in a vertical direction definitely occurs within a zone 10-20 km deep and, in some places, 50-60 km beneath the earth’s surface. Matter may also be moving from the deeper zones of the earth, but this process no longer plays an important role in the general cycle of matter. The continuous cycle of matter can be observed directly in the atmosphere, hydrosphere, upper part of the lithosphere, and biosphere. The cycle has changed since the biosphere appeared (about 3.5 billion years ago). Biogenic processes were added to the physical and chemical transformations. Finally, man’s current activity has become an enormous geologic force. Thus, the cycle of matter on earth has changed in the course of the evolution of our planet, and in the Recent period, from the geologic standpoint, it has been most intensive on the earth’s surface. Only a small part of the matter of the lithosphere, atmosphere, hydrosphere, and biosphere is simultaneously involved in intensive exchange. The cycle on earth consists of many varied transformations and migrations of matter, the basic features of which are recurrent. Individual cyclical processes are a succession of changes in matter alternating with temporary states of equilibrium. As soon as a substance emerges from a particular thermodynamic system with which it was in equilibrium, it keeps changing until it returns in part to its original state. It never completely returns to its original state. At the same time, these recurrent processes on the earth’s surface tend to stabilize the earth’s relief. The hydrologic cycle is an excellent example of this (see Figure 1). Figure 1. Diagram of the hydrologic cycle. The amount of water is given in kg/cm2 a year for the earth’s surface. 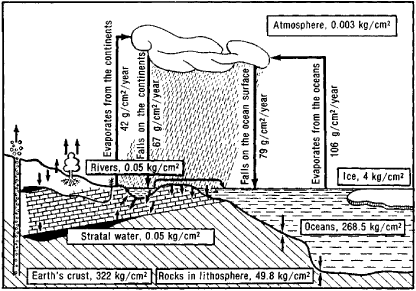 Evaporation and precipitation are given in g/cm2 a year for the ocean surface or continents, respectively. but in the process its isotopic composition is disrupted. It loses heavy hydrogen in comparison with ocean water as a result of fractionation of the hydrogen isotopes during evaporation. A regular, steady exchange takes place between the surface layer and the water mass of the deeper zones of the ocean. Temporary local equilibriums are established between the water vapor, atmospheric water, and water of bodies of water. Water vapor condenses in the atmosphere, capturing atmospheric and volcanic gases. The water then falls on land. In the process, some of the water enters into chemical compounds, while another part in the form of crystal hydrate, in sorbed form, and so forth is bound by loose sediments of the earth’s crust, sinks with them, and leaves the main cycle for a long time. In the course of metamorphic changes and burial deep in the earth, as a result of pressure and high temperature (for example, intrusions), the sediments lose their water. This water rises through pores in the rocks and appears in the form of thermal springs or stratal water or the earth’s surface or is ejected with vapors during volcanic activity together with some juvenile water and gases. The rest of the water (the largest part), however, removes soluble com-pounds from the rocks of the lithosphere, breaks rocks down, and flows back to the ocean in rivers. The salt composition of the ocean has changed in geologic time as a result of this process. Chemical elements forming readily soluble compounds accumulate in sea water. Poorly soluble compounds of chemical elements quickly settle to the bottom of the ocean. Another example is the calcium cycle. Limestones (like other rocks) disintegrate on the continents and the soluble calcium salts (bicarbonate of calcium, for instance) are carried by rivers into the sea. About 5 X 108 tons of calcium are discharged into the sea from the continents every year. In warm seas, calcium carbonate is intensively consumed by lower organisms, such as foraminiferas and corals, to build their skeletons. After they die, their skeletons of calcium carbonate form sediments on the sea floor. The sediments metamorphose with time, forming the rock limestone. As the sea regresses, the limestone becomes exposed and appears on land where the process of its disintegration starts. However, the composition of the newly formed limestone is somewhat different. Paleozoic limestones, for example, were found to be fairly rich in magnesium carbonate and accompanied by dolomite, whereas the younger limestones are fairly poor in magnesium carbonate and almost no dolomite strata have been formed in the Recent period. Finally, limestones may be partly assimilated during the outflow of lava, that is, they may enter the great cycle of matter. Thus, individual cyclical processes that make up the general cycle of matter on earth are never completely reversible. Some of the matter in the recurrent transformation processes is scattered and is drawn into particular cycles or captured by temporary equilibriums, while another part returns to its original state but with new characteristics. The duration of a cycle can be roughly estimated from the time required for the entire mass of a particular substance to go through one complete cycle on earth (see Table 1). Chemical elements and compounds, fairly complex associations of matter, and organisms participate in the cycle of matter. The processes of change in matter may assume primarily the character of mechanical displacement, or they may assume the character of physicochemical conversion or even more complex biologic transformation, or they may have a mixed character. Like the individual cyclical processes on earth, the cycle of matter is maintained by the energy flowing to it. Its main sources are solar radiation, position energy (gravitational energy), and radiogenic heat of the earth, which at one time was exceptionally important in the processes taking place on earth. The energy arising from chemical and other reactions is of secondary importance. It is possible to determine the energy expended for some individual cycles of matter. For example, about 10.5 X 1023 joules (2.5 X 1023 calories), or 10 percent of the total energy received by the earth from the sun, is expended on the annual evaporation of water from the ocean surface. A classification has not yet been developed for the cycle of matter on earth. It is possible, for example, to speak of the cycles of individual chemical elements or of the biological cycle of matter in the biosphere. It is also possible to distinguish the cycle of atmospheric gases or water, solid substances in the lithosphere, and cycles in two or three adjacent geospheres. Many Russian scientists have studied the cycle of matter. V. I. Vernadskii identified a geochemical group of cyclical chemical elements, including almost all the widely distributed and many rare chemical elements—for example, carbon, oxygen, nitrogen, phosphorus, sulfur, calcium, chlorine, copper, iron, and iodine. V. R. Vil’iams and many others studied the biologic cycles of nitrogen, carbon dioxide, phosphorus, and so forth in relation to soil fertility. Among the cyclical chemical elements, carbon, nitrogen, phosphorus, and sulfur play a particularly important role in the biogenic cycle. Figure 2. Diagram of the carbon cycle. Amount of carbon is given in g/cm2 of the earth’s surface. Carbon exchange is given in γ(1 X 106g) per cm2 of the earth’s surface a year. Carbon is the main biogenic element, and it plays the most important role in the formation of living matter in the biosphere. Carbon dioxide is assimilated from the atmosphere during photosynthesis by green plants and converted into many different organic compounds. Plant organisms, especially the lower microorganisms and marine phytoplankton, because of their exceptional speed of reproduction, produce annually about 1.5 X 1011 tons of carbon in the form of organic matter, which is equivalent to 5.86 X 1020 joules (1.4 X 1020 calories) of energy. Plants are partly consumed by animals (more or less complex food chains are formed in the process). 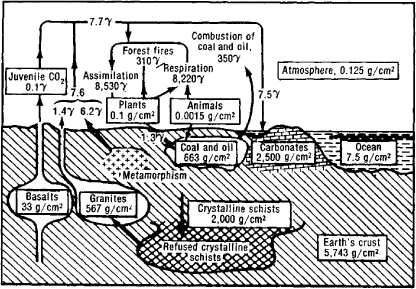 As a result of the respiration of organisms, decomposition of their bodies, fermentation, decay, and combustion, organic matter is ultimately converted into carbon dioxide or deposited in the form of sapropel, humus, or peat, which in turn give rise to many other caustobioliths— coal, oil, and fuel gas (see Figure 2). Bacteria (for example, saprophytic bacteria) and many fungi (for example, mold) play an enormous role in the decomposition and mineralization of organic matter. A very small part of the total carbon mass participates in the active carbon cycle (see Table 2). A vast amount of carbonic acid is preserved in fossil limestone and other rocks. A dynamic equilibrium exists, in turn, between atmospheric carbon dioxide and ocean water. Many aquatic organisms assimilate calcium carbonate and create their own skeletons, and then limestone strata are formed from them. Tens of thousands of times more carbon dioxide was extracted from the atmosphere and buried than is currently present in it. The atmosphere is replenished with carbon dioxide through the processes of the decomposition of organic matter, carbonates, and so forth, and increasingly as a result of man’s industrial activity. Volcanoes are an especially abundant source, for their gases consist mainly of carbon dioxide and water vapor. Some of the carbon dioxide and water ejected by volcanoes is regenerated from sedimentary rock, limestone in particular, when the rock comes into contact with magma and is assimilated- During the carbon cycle, carbon is repeatedly fractionated into its isotopic composition (12C—13C), especially in the magmatogenic process (formation of CO2, diamonds, carbonates) and during the biogenic formation of organic matter (coal, oil, tissues of living organisms). soils and ocean water and (2) biologic fixation of N2 by nodule bacteria, free nitrogen fixers, and other microorganisms. The first method yields about 30 mg of NO’3 per m2 of the earth’s surface in a year and the second about 100 mg of NO’3 per m2 in a year. The significance of nitrogen in metabolism is widely known. It forms part of proteins and their varied derivatives. The residues of organisms on the earth’s surface and those buried in the rock mass are constantly being decomposed by numerous microorganisms. Organic nitrogen undergoes a variety of conversions in these processes. Elemental nitrogen is formed as a result of denitrification with the participation of bacteria, and it returns directly to the atmosphere. For example, there are underground gas jets consisting almost entirely of pure N2. The biogenic nature of these jets is proved by the absence of argon (40Ar), which is common in the atmosphere, in their composition. The decomposition of proteins also produces ammonia and its derivatives, which then enter the air and ocean water. 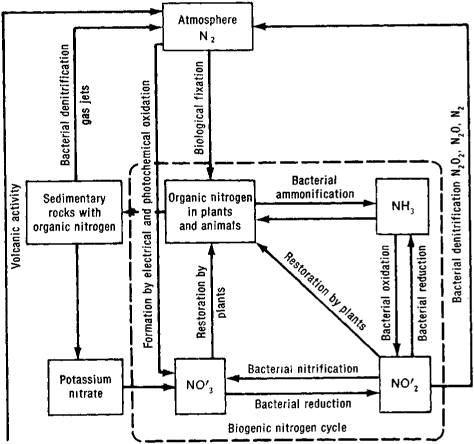 Various nitrogen oxides (N2O, NO, N2O3, and N2O5) are formed in the biosphere as a result of nitrification—the oxidation of ammonia and other nitrogen-containing organic compounds with the participation of the bacterium Nitrosomonas and nitrobacteria. Nitric acid reacts with metals to yield salts. Potassium nitrate is formed on the earth’s surface in an oxygen atmosphere in a hot dry climate in places where algal residues are deposited. Potassium nitrate accumulates in deserts on the bottom of wind-eroded hollows. As a result of the activity of denitrifying bacteria, nitrates may be reduced to nitrous acid and then to free nitrogen. The source of phosphorus in the biosphere is mainly apatite, which is found in all magmatic rocks. Living matter is a major factor in the conversion of phosphorus. The organisms extract phosphorus from soils and water solutions. Phosphorus forms part of proteins, nucleic acids, lecithins, Phytin, and other organic compounds, and it is particularly abundant in animal bones. When the organisms die, phosphorus returns to the soil and to bottom deposits. It is concentrated in the form of marine phosphate concretions, deposits of fish bones, and guano, thereby creating conditions conducive to the formation of phosphorus-rich rocks, which in turn become sources of phosphorus in the biogenic cycle. The sulfur cycle is also closely bound up with living matter. Sulfur is ejected by volcanoes in the form of trioxide (SO3), dioxide (SO2), hydrogen sulfide (H2S), and chiefly elemental sulfur. Various sulfides of metals—iron, lead, zinc, and so forth —are naturally abundant. Sulfide sulfur is oxidized in the biosphere through the action of numerous microorganisms, producing sulfate sulfur (SO”4) in soils and bodies of water. Sulfates are absorbed by plants. Sulfur forms part of the amino acids and proteins in organisms, and in plants it forms part of the essential oils. The decomposition of the residues of organisms in soils and marine oozes is accompanied by highly complex transformations of sulfur. Hydrogen sulfide is formed during the breakdown of proteins by microorganisms, and it is then oxidized either to elemental sulfur or to sulfates. A variety of microorganisms that create numerous intermediate sulfur compounds take part in this process. Sulfur deposits of biogenic origin are known to exist. Hydrogen sulfide may again form “secondary” sulfides, and sulfate sulfur may produce gypsum deposits. The sulfides and gypsum, in turn, are again decomposed, and sulfur resumes its migration. All the matter of the lithosphere as a whole undergoes intensive transformations and participates in the small and large cycles of matter. The matter on the earth’s surface is decomposed by the sun’s rays, oxygen, carbon dioxide, water, and living matter. 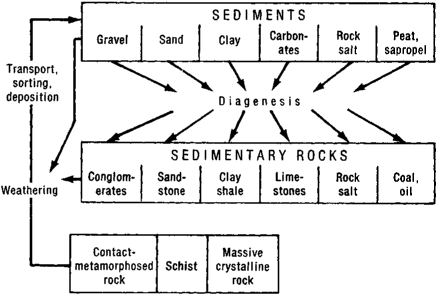 The decomposition products are carried away by the wind or, if in solution, discharged into the seas and oceans where they settle to the bottom, undergo compaction, become cemented, form stratified sedimentary rocks, and then, under the influence of pressure, become converted to crystalline schists. Thus, about 2.7 X 109 tons of matter are carried away by the rivers every year. This is called the small cycle of matter on earth (see Figure 4). Crystalline schists and other rocks formed during the small cycle take part in the large cycle of matter. Sinking deeper, they reach the magmatic region of the earth, where they are exposed to pressure and high temperature, become remolten, and may again be expelled to the surface in the form of igneous magmatic rock. Study of the cycle of matter on earth is not only of theoretical interest, it also has considerable practical value. Man’s influence on natural processes is increasing constantly. The consequences of this influence are comparable to the results of the geologic processes. New migration routes of substances and energy arise in the biosphere, and many thousands of chemical compounds previously not characteristic of the biosphere appear. New water basins are created, thereby changing the hydrologic cycle. Enormous supplies of metals, phosphates, and sulfur are concentrated in man’s hands. Vast quantities of nitrogen-containing substances are synthesized to produce fertilizers. As a result the usual course of the geochemical processes is changing. A thorough study of all the natural transformations of matter on earth is a prerequisite of man’s exerting a rational influence on his habitat and changing natural conditions in the direction that he desires. Vernadskii, V. I. Ocherki geokhimii, 4th ed. Moscow-Sverdlovsk, 1934. Fersman, A. E. Geokhimiia, vols. 1-4. Leningrad, 1933-39. Vinogradov, A. P. Geokhimiia redkikh i rasseiannykh khimicheskikh elementov v pochvakh. Moscow, 1950. Vinogradov, A. P. Vvedenie v geokhimiiu okeana. Moscow, 1967. Vil’iams, V. R. Sobr. soch., vol. 6. Moscow, 1951. Borchert, H. “Zur Geochemie des Kohlenstoffs.” Geochimica et Cosmochimica acta, 1951, vol. 2, no. 1. Rankama, K., and T. G. Sanama. Geochemistry. Chicago, 1950.